When tennis youngsters play competitions or tournaments, some of them think that their shots cannot finish the point or hit penetrating shots because their shots do not have that much power. This can happen on forehands commonly and also backhands. Then they start to try to hit the ball harder by doing wrong things like tightening up. Even some kids hit the ball with two much rotation and cannot control the ball so much easier and this may cause the ball to go in all sorts of directions on the tennis court. To hit the ball harder, you need to hit the ball correctly first and not just trying to muscle the ball with only your arm. Here are some tips for adding a lot more pace and power to your forehands shots. Firstly, you must be very relaxed, fluid and loose during the swing of the forehand. When you are making the swing, try not to have many faults or stops at all in the swing so it can be as smooth as possible. A full and smooth swing is fundamental to hitting a consistent, effortless, powerful forehand. Secondly, you must accelerate a lot in the swing and very fast to produce a lot of power to your forehand, but remember still be relaxed during the swing and have a full swing at the same time to ensure all the maximum power. 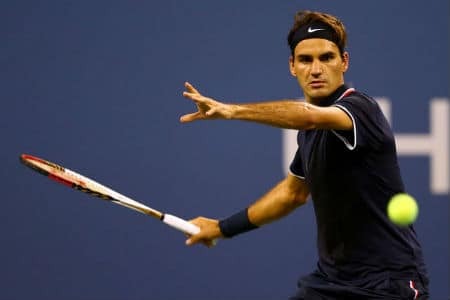 Lastly, you must not tighten up to hold the racket when swinging, otherwise you may not produce any power because you will just poke and push the ball and you absolutely cannot make any power in your forehand. After tightening up, you may commonly tuck your dominant arm in too much and not have much area to swing into.